Missed out on an earlier issue? Below are links to our previous editions. Some people have been experiencing difficulties using ‘right-click > save as’ in Internet Explorer. Instead, click on the links to open the PDF in your browser, then use ‘File > save as’ to save it to your computer. Alternatively, use the zip links below. Welcome back, one and all, for our latest issue of Irregular Magazine, Issue 7 Volume 2 for Autumn 2018! As the days begin to get shorter in the northern hemisphere, and we’re forced to spend more time indoors, we take a look at some of what will be keeping us excited in the hobby over the next few months, until that daylight comes back again. We take a look at two of the newer offerings from the giant in our hobby. Games Workshop has been bringing us many new things recently, an we take a look at work to them: Adeptus Titanicus, the return of the small-scale giants of the battlefield to our hobby tabletops; and we also have a look into Games Workshop’s return to Middle Earth with their latest release on their now renamed Middle Earth Strategy Battle Game. As well as bringing us the latest news, including news on new boardgames that have been release, a painting competitions from Mantic Games and GCT Studios, and more – our beloved editor also updates us on his progress in fighting his own grey hoard, a perpetual battle that we all endure! Finally, in a nod to past issues, we’ve revisited an article brought to us by David Heathfield looking at Zenithal Highlighting and painting clothing, perfect for those of you who painting miniatures is part of your hobby! We’d like to welcome you all back once more, to present our latest issue of Irregular Magazine, Issue 5 Volume 2 for Winter 2018! Yet again, there is some fantastic hobby content for you to read at your leisure, as we report on a variety of hobby topics and new games and we have a round-up of the news that has been breaking in our hobby world. Our Editors lifelong passion for the Roman Empire raises its head once more as he looks at crime in the Roman world. We have two different articles looking at Roman terrain for gaming in this period, as well as a look at the new skirmish game, Gangs of Rome. Welcome once more lovely readers! 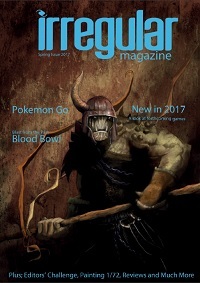 Once again we’re beyond excited to be able to present to you a brand new issue of Irregular Magazine, Issue 4 of Volume 2 for Summer 2017! And, once again, we have a great set of interesting articles for your to consume at your leisure! We have a further look at the Pathfinder RPG, which we started in the last issue, with a look at the Adventurers Guide supplement for this classic RPG. We also have a number of great interviews in this issue. The first is with a games manufacturer located in Shanghai Longpack Games; who share with us some of the trials and tribulations of how they go about physically creating the games designed by other companies. Also, we talk with the new UK games company Raku Games, about their first offering, Krill, and about the whole process of designing a game. A further very interesting interview around games design is with James M Hewitt, a games designer of renown, who has worked at both Mantic Games and Games Workshop and now is going solo with his own company! And finally for the interviews, we talked with Model Box, the e-commerce company providing a curated box of items suitable for the miniature hobbiest! Continuing our Blast from the Past series, Alex takes a look at the Mk I Land Raider, that was available from Games Workshop in 1988. If you’ve been playing Warhammer 40,000 long enough (like our Webmaster has!) then you might have owned one of these classic, mighty battletanks! Fresh from Gencon 2017, we have a look at the first ever chibi-style painting competition, The Golden Kobold, that was hosted by Ninja Division Publishing. There are also a look at a number of games, both new and old in this issue. We have a look at a new phenomena in co-operative gaming, Exit Games, specifically we review The Pharaoh’s Tomb which we were lucky enough to get our hands on! There is a quick look at Brutal Kingdom, the quick-play game to gain the most power, in this offering from Thames & Cosmos. We also have a review of Open Combat, a miniature skirmish game from our friends at Second Thunder. If you like miniature skirmish games and you’ve not seen Open Combat before, you really should check it out! The upcoming re-release of Necromunda, from Games Workshop’s Specialist Games division has caught the attention of many gamers, so we have a look back at what we remember from the last time we played this excellent game and advance of the new edition! And finally for the games reviews our editor has had a look at Cold War Commander, the miniature wargame of modern warfare, and he gives us his thoughts and review. We also have write-ups of our attendance at the UK Games Expo from earlier this year, held at the NEC in the UK, as well as a visit to Warhammer World – a favourite of many a miniature wargamer and we look at what such a visit has to offer! Welcome back once again dear reader! We are buzzing here at Irregular Magazine to be able to present Issue 3 of Volume 2 of Irregular Magazine for Spring 2017. In this issue, we have a number of great articles! We have taken a good, and perhaps long overdue, look at the Pathinder RPG that is a favourite of many role-players worldwide as well as a discussion about how RPGs can be a solution to fitting gaming into our increasingly busy lives. There is an examination of new games: Cornish Smuggler, from Grublin Games; The Football Game, a football club management game from London Games Company and much anticipated Walking Dead tabletop game from Mantic Games, based on the TV series and movies. Our editor continues with his various challenges to get as much of his grey army as possible into a nicely painted state – and he’s now added the miniatures from his board games to the list! He’s also write a nice guide to simply painting 1/72 scale miniatures with the help of dip varnish. We’ll also be looking at Blood Bowl in a Blast from the Past; although it is also a current game with the recent re-release of the perennially popular games from Games Workshop celebrating 30 years since it was first released! Alex has taken a good look at the latest Star Wars film, Rogue One (spoiler alert ahead!) giving us an in depth review as well as his thoughts for the future of Star Wars films. We also have a great review of one of the most popular apps on the planet: Pokémon Go, from the pen of Sophie Fiest that is well worth a read! Jason has written an overview of the kinds of terrain that was around in the pre-Roman period, which is a superb inspiration for anyone looking to build terrain for either this period, or indeed later periods, of historical gaming. We also look forward to both the UK Games Expo 2017 and Salute 2017 shows in the UK; as well as looking forward to what other games we should expecting to enjoy in 2017 as Alex reviews the games and updates we expect to be released! Continuing with our theme of Irregular, its been a little while, but we’re overjoyed to present Issue 2 of Volume 2 of Irregular Magazine for Summer/Autumn 2016. We think its a great issue! In this issue, we have a great number of articles! There are a reviews of a module for the long standing game D&D 5th, Princes of the Apocalypse and a look at a new rules set on its path to creation, The Shattered Crown. We have reviews of Games Workshop’s Imperial Space Marine Anniversary Figure, Lynn Stahl’s AFV Acrylic Techniques DVD and our look at the excellent Figopedia book penned by Jérémie Bonamant Teboul. We have two hobby tutorial, one on making your own gore for decorating your ickiest figures and a second how to build planets and moons as scenery for your space-based wargaming. Finally we also have a fast-paced short story again from our good friend Taylor Holloway and our editor has a new passion in the form of 1/72 Napoleonics that he talks about as well as a continuation of his Gaming on the Cheap series. But we’re back again now with another superb issue for everyone. We have a couple of neat tutorials looking first at making cheap terrain and another on how to build your own Roman villa. We have a really interesting interview with Ronnie Renton of Mantic Games about why mantic have gone down the route of using Kickstarter, as well as a look at Mantic’s most recently completed Kickstarter campaign, Deadzone. Also in this issue we have a background piece that can be used for Stargate games, either RPGs or wargames if you’re interested in running an alternative Stargate universe based in the UK. 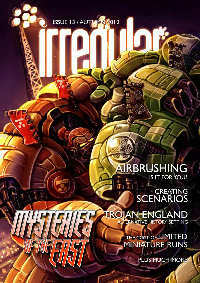 We have three showcases this issue looking at the work of the talented illustrator Conor Nolan, a look at some of Ian Powell’s wonderfully painted miniatures and the third showcase features Graham Shirley’s awesome Warhammer Greenskin army of Hazmat Gutspilla and the Red Tribe. All three showcases are really well-worth reading. 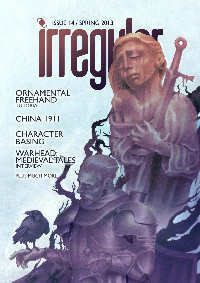 Finally, we round off this issue with a great short story from the pen of ShaNeil Harada and we have reviews of two games, Dungeon Command and Helldorado. Yet again, we have another fantastic issue for everyone. We have a couple of really interesting opinion pieces looking at shopping on the internet vs. the highstreet and at the online phenomenon that has really exploded this year: Kickstarter. 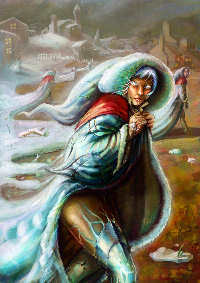 We also have a great short story for your entertainment from the talented pen of Dave Jackson. There is also an interview with Jon Robertson of Urban Mammoth about Warheads: Medieval Tales, a look at painting a ruined tower and a great guide to making your own character bases. Daniel Liefer gives us some excellent advice on painting freehand and there are reviews of Fantasy Flight Games’ Gears of War boardgame and the Dredd 3D movie. 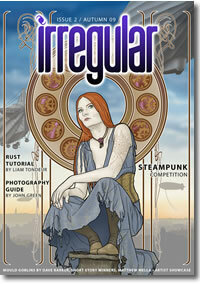 There was no publication of Irregular Magazine in Spring ’13. Apologies for any confusion. Once again, we have another great issue, packed with excellent articles and tutorials. We have a really interesting look at the costs of producing limited miniatures runs and a discussion around how to create scenarios for wargames, as well as a further look into the world of Magic: The Gathering. We also have a painting guide for Clone Troopers in 15mm scale and a look at whether Airbrushing would be right for you. We also have a look into two different historical backgrounds – The Persian Empire and Trojan England (no, really! Well worth reading). We also priviledged to have an excellent piece on the future sport of Robo Basho, a world of 2115 where Giant Robots are piloted into combat in a heavy metal form of sumo! 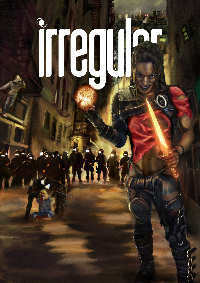 There was no publication of Irregular Magazine in Summer ’12. Apologies for any confusion. 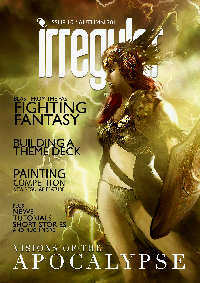 Another great issue packed with excellent articles and tutorials. We have a great retrospective looking at a Empire, a computer game from the 70s that is still being played today on the internet. We also have another peek into our developing world for the Traveller RPG, this time some NPCs for players to encounter, there is a review of Leeds Armouries and a look at how the Goths played a part in the downfall of Rome. There are three tutorials this month; two great guides from Lyn Sthal – a guide to basing and a tutorial on painting faces. We also have the second of a series of articles by Alex Garbett focusing on terrain for spaceship wargaming. This article looks at making stars. There is also our usual review section and a new instalment of Tuk Tuk, by the talented Will Kirby in yet another packed edition of the magazine. Our Winter’s Eve themed issue of the magazine is once more jam-packed with some excellent articles and tutorials. We look at the D8 RPG Sins, and the Abney Park’s Airship Pirates RPG, and focus on the artwork for Airship Pirates with an interview of some of the artists involved. There are two tutorials; a seasonal guide to snow basing and the first of a series of articles focusing on terrain for spaceship wargaming looking at making planets. There are also plenty of reviews and yet another great instalment of Tuk Tuk and much more! This issue the theme is Apocalypse. In our tutorial section we have a guide to painting a Firestorm Armada space ship. In RPG we take a look at possible apocalyptic scenarios. 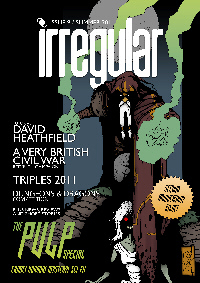 The community section has a showcase with David North, cover artist of issue 9, and a report on IMP 2011 show. Nick Johnson builds a theme deck for the Legend of the Five Rings CCG and Dave Barker looks back at the Fighting Fantasy books. We have a short story from Taylor Holloway, plus plenty of great reviews, Tuk Tuk from Will Kirkby, news and much, much more. This issue our theme is Pulp. Cover artist David North has created a superb cover which includes many of our favourite Pulp themes.As usual we have reviews, tutorials, articles and a two short stories plus another episode of our comic Tuk Tuk. 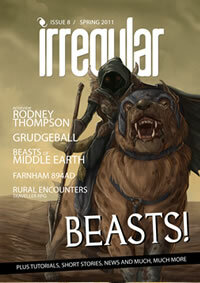 This issue our theme is Beasts. Cover artist Brynn Metheney has created a stunning cover with a real knock out beasty. As usual we have interviews, reviews, tutorials, articles, a short story and the results of last issues painting competition plus another episode of our comic Tuk Tuk. 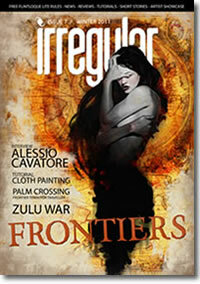 Our Fronties themed issue had a stunning cover by artist Diego Gisbert Llorens, the theme continued with Palm Crossing a frontier town for Traveller RPG, reviews of Tea Wars and Clockwork and Chivalry, as well as a historical piece on the Zulu War. 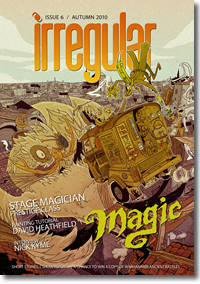 Our Magic themed issue had a stunning cover by out Tuk Tuk artist Will Kirkby, the theme continued with a step by step tutorial on how to paint Discworld’s Nanny Ogg, a guide to the mages of MiddleEarth and a Stage Magician Prestige class for RPG. A slew of show reports included Games Day UK and USA. We interviewed Black Library author Nick Kyme, and David Heathfield gave us a comprehensive guide to the application of paint. Our first anniversary issue was a bumper affair. 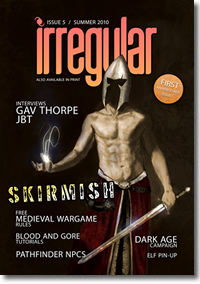 This issue included an interview with Jérémie Bonamant Teboul and author Gav Thorpe, part 1 of our Dark Age campaign using Warhammer Ancient Battles, City Guard NPC and some A Very British Civil War articles. Tutorials included chipping, blood effects and painting 1:72 scale figures. There were show reports on Salute and Derby ConQuest, plus our favourite skirmish video games. We also included an article on the gladiator revolt, I’m Spartacus and a medieval rules supplement – Men at Arms. 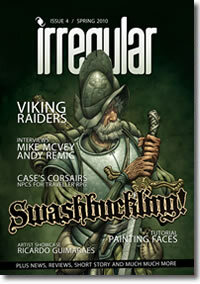 This issue included an interview with Mike McVey and author Andy Remic. We brought you articles on Viking raiders, pirates for Traveller, and a look at the best swashbuckling movies ever. Our tutorials included a fantastic tutorial by David Heathfield, and how to make photo scenery the easy way. 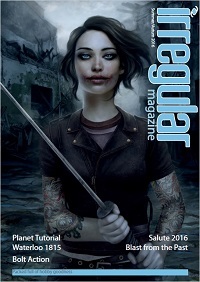 We also packed in two short stories and reviews of 6D6Fireball and Savage Worlds, plus much, much more. 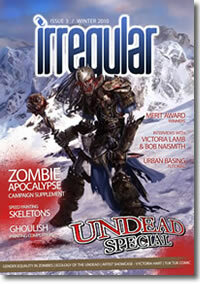 This issue included a free zombie apocalypse gaming supplement, an unusual Goblin army, tutorials for urban basing and speed painting skeletons, interviews with Victoria Lamb and sculptor Bob Naismith as well as a look at the undead decks available in Magic: The Gathering, plus much more! 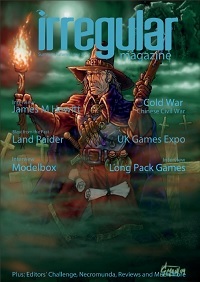 This issue included a guide to photographing your minis, Mould Goblins for DnD, tutorials for painting rust and making scenery on a CD, an article on the Peasants revolt and a show report on Games Day UK 2009, plus much more! The very first issue included tutorials for non-metallic metals, painting lava bases and painting a Vindicator with washes, articles for an ECW campaign, how to make an industrial base, Carter & Sons D20 NPC and much more!